The 1920’s brought post war prosperity but not before the 1920-21 recession. Monetary Policy was used for the first time as the FED tightened to stop post war caused inflation. A sharp short recession. ensued. Before the coming boom there were troublesome times as arguing over the banker supported League of Nations. 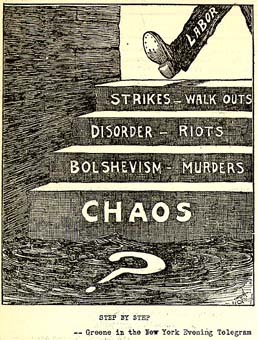 At home the 1919 strikes, riots created a growing fear of radicals and terrorists who wanted labor reform. It was part of a world-wide questioning of WWI causing authoritarian central governments. Harding easily won with an isolationist policy of the Republican party conservative wing. A decade long battle with the liberal banker wing resulted, Bankers wanted U.S. dominance of International Trade Interestingly they easily accepted the pro business administration's insistence they approve foreign loans as it came with military support when countries defaulted of their bank loans. Morgan banker Thomas W. Lamont was the leading international banker of his day. 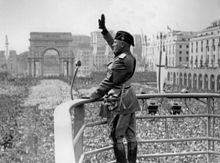 He provided Benito Mussolini with a PR campaign to soften world opinion of his fascist strong-arm activities and got Washington to take Italy off the no loan list. A $100,000,000 Morgan loan to Italy followed and soon led to bankers making loans to Italian manufacturers. He directed attempts to solve the German reparation problems which had bedeviled international politics after World War I and the Treaty of Versailles. The 1924 Dawes Plan was acclaimed in Germany as an acceptable adjustment attempt but the1929 negotiated Young Plan it failed miserably as fascists were taking over Germany. Both the FED and Wall Street bankers supported England's return to the Gold Standard at a pre- war parity of $4.66 per dollar. FED chairman Strong went against J. P. Morgan and supported the Sterling with both low US interest rates as the Bank of England kept rates high. Morgan didn't want low U.S. rates. A run was expected and credits lines from the FED and Morgan totaled $300,000, 000. They were not needed though each earned 1%. As economist Keynes predicted the over valued pound could not compete internationally in textiles and steel resulting in English worker real wage decreases. Both a Coal and a general strike resulted. Chancellor of them Exchequer W. Churchill later acknowledged this his greatest mistake. Politicians would soon learn that it's the economy, stupid. Later the low U.S. rate combined with a 10% margin requirement would help cause a bull market that some feel was brought down by an August of 1929 FED rate increase. 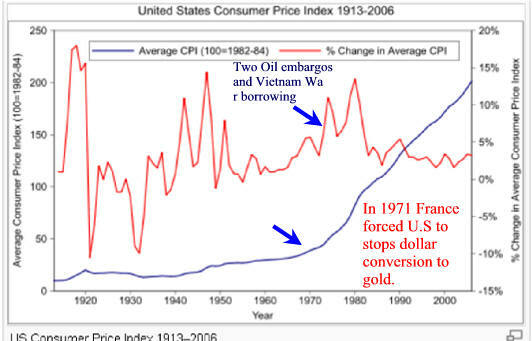 Bankers did not want politicians to control the value of money fearing inflation as a cure for debt. By 1970 their fears came true and the age of inflation resulted. Eventually boom times returned and the stock market finally got back to 1907 levels. Prohibition fostered by conservative religious oligarchs began its 13 year reign in 1920 brought. 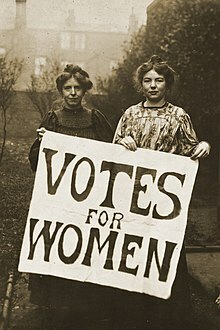 Liberal activities by unions, suffragettes and socialism brought government action, some good like 19th Amendment and some not so good as “…intense government persecution of radical political dissidents in response to the postwar Red Scare…” that was sweeping the nation liberal oligarchs set up a Totalitarian state. Conservatives around the world feared the redistribution wealth effects of Communism and its antireligious component. Monarchies with the inherited wealth and the power that goes with being part of the nobility were particularly unhappy. Many, including England and the United States finance and fought in the failed in Russia’s anticommunist counter revolution. 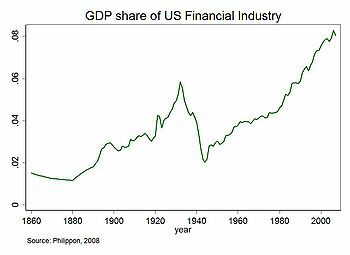 Prosperity again brought banker excesses and the Wall Street Crash of 1929 brought down the much of the banking system and with it much of the US economy causing the Great Depression. Representatives attending the 1921 Conference on Unemployment held in Washington, D.C.
Click to enlarge some pictures. According to Benito Mussolini fascism politicizes everything spiritual and human: "Everything within the state, nothing outside the state, nothing against the state." The flag of the Battalion of Death was later integral to the Volunteer Army of the White Russian Counter Revolutionary Army It eventual lost to the revolution now Bolsheviks. As feared politicians have not been able to control the printing press. Keynesians worry about employment and Monetarist lead by the Australian School wanted stable money supply and resulting stable prices. 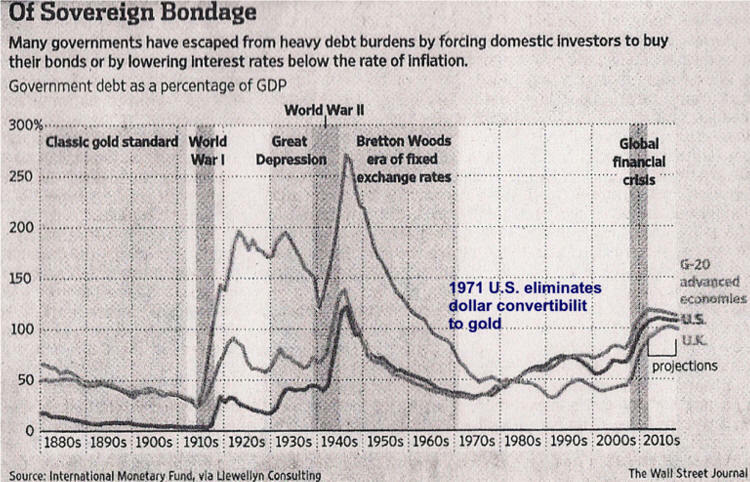 paid 20th century war debt back. It was refinanced. The inflation of the 1970's hurt a lot of retired people on fixed income. To help a 1975 SS added a cost of living increase. This would require a 1983 tax increase. As usually there was an eight year delay in paying for the new program. MY PARENTS AND EVENTUALLY THEIR CHILDREN BENEFITED. An adjustment for Bush 2's Medicare D benefit is due though Obama Care will probably cause confusion and higher taxes. Early in the 1930's Adolph Hitler used German hatred caused by excessive WW I reparations the long economic depression following the war with uncontrollable inflation to create a strong nationalist government modeled after Mussolini's Fascisms. Using terror to take control of a weak unpopular government, Hitler using loans from bankers world-wide and confiscated wealth and began a many year military build-up. Russia uses propaganda to spread its form of socialism called Communism. It required revolution rather than evolution. The Japanese invasion of Manchuria signaled the beginning of a new colonial building period based on nationalism. Western Europe had used capitalism and religion to colonize all the best areas. U.S. recession turmoil increased when the Senate refused to agree with the House which had and move up of a WWI veteran bonus to alleviate the pain from high unemployment. An Army of U.S, Veterans 1932 march on Washington and trouble resulted. Over the years many have marched, some have died. FDR would bring change. Liberals around the world said socialism was the economic answer to depression. The Share the Wealth movement founded by Huey Long who would later be assassinated was one of many liberal social activists throughout the U.S. and Western Europe. These activities would be countered by conservative banker and business leader oligarchs who backed Herbert Hoover’s use of laissez fair Classical economic policy. The first policy mistake was by Hoover. He followed the Republican party against his own and beliefs of those of many economists and signed the Smoot-Hawley Tariff Act. Many countries soon followed and the resulting decrease in world trade hurt everyone. The Federal Reserve tried to maintain the Gold Standard with two discount rates increase of 1 point each. Then there was the Revenue Act of 1932 which dramatically increased federal taxes. Both were right out of the Classical Economics toolbox. So was the $200,000,000 U.S. bank loans to keep Britan on the Gold Standard. Al efforts failed. Britan went off first followed by the U.S. in 1933. The economy hit bottom in 1933 and spending printing money was the only way out of deflation which made existing loans more expensive to maintain and also made business less apt to borrow. Hover lost the 1932 election. as FDR promised to use liberal Keynesian economic policy of government action to solve the continuing economic recession. His New Deal employment programs would be the first time U.S. government would use massive debt to solve a major non-military problem. Like the war debt from WWI and following wars, the debt would not be paid back. As debt was retired the funds came from new debt. Inflation and economic growth would ease the interest payment pain. Major legislation included the Social Security Act which covered Old-Age, Survivors, & Disability Insurance, the Fair Labor Standards Act/1938 which set maximum work hours and minimum wages, the Agricultural Adjustment Act/1938 which provided fair price for farmers, and the Prohibition Discriminatory Employment related to federal employment .The Wagner Act along with other pro labor reforms were also passed. Conservative fought back using a conservative Supreme Court which declared some New Deal legislation illegal. The battle over Keynesian vs. Classical Economics continues today. Many conservatives do not mind government action and debt for military but disagree with Liberals who want to use debt to solve economic problems. Both oligarchies to date have not believed that cost effectiveness applies to their perceived governmental responsibilities. Politicians from both political parties act unhappy despite benefiting from an electorate that lives much better because of massive federal annual deficits plus the economic benefits of an annual balance of payments deficit amounting to $1,700 per person. The later represents cheap goods from abroad where dollars accumulate to eventually spent with little benefit to U.S. citizen. Voters let politicians buy their vote with these debts disliking all members of Congress but their own! After Germany invaded Poland starting World War II President Roosevelt asks the Congress for a defense budget hike and the United States declares its neutrality. Many wanted the US to stay out of the war and just as many profited as US loans to Europe were spent with US companies that supplied war arms and food to belligerents. Citizens had begun to prosper after a decade of recession. 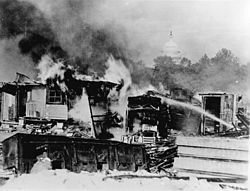 Shacks that members of the Bonus Army erected on the Anacostia Flats burning after the confrontation with the military. Willis C. Hawley (left) and Reed Smoot in April 1929, shortly before the Smoot-Hawley Tariff Act passed the House of Representatives. 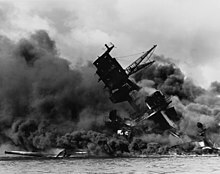 1940 had the U.S. Congress approving the first peacetime conscription draft which was justified by Japan's December 7, 1941 attack on Hawaii's Pearl Harbor. 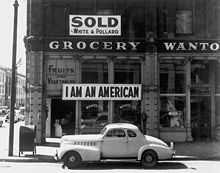 n 1944 the United States Supreme Court rules the wartime internment of Japanese Americans on the West Coast was valid during a time of war. This type of subjugation of human rights began in the John Adams administration with the Alien and Sedition Acts which limited citizen rights because of American paranoia over revolutionary ravaged Europe. It continues today with Federal surveillance areas needed to fight the War on Terror. on the aircraft carrier Akagi. 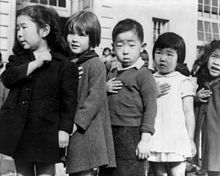 Weill public school children pledge allegiance to the American flag in April 1942 prior to the internment of Japanese Americans. 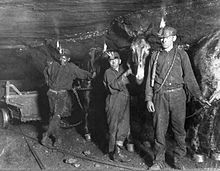 End of war layoffs caused four hundred thousand mine workers to strike with other industries following their lead. The 1947 Truman Doctrine pledged to contain Communism. It began with $400 million of loans to help Greece and Turkey. It was used to buy US military materials needed to fight Communism. Not only were there no was reparation payments for the losers, but the U.S. Marshall Plan loaned 12 billion dollars which would be used to rebuild Europe. Loans were mostly spent in the U.S. for military, economic and political needs. Congress over-rode President Truman's veto of the Taft-Hartley bill thus Congress rolled back many of the advantages labor had gained with the 1935 Wagner Act. Many Democrats joined with Republican lawmakers to curb the power of unions. Truman uses an airlift to overcome Russia's "Berlin Blockade (24 June 1948 – 12 May 1949). It was one the first major international Cold War crisis. Congress goes after unions bosses with Taft-Hartley Act. 1950 began with an enhanced battle between capitalism and communists. 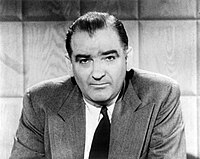 The Chinese backed North Koreans began the Korean War and contributed to Senator Joe McCarthy's communist witch hunts initiated a Second Red Scare. Oligarchs the Supreme Courts rules segregation illegal. Public acceptance would take many years. 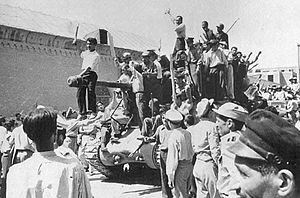 An Iranian coup sponsored by England and the United States kept the capitalist mostly Christian West in control of mostly Muslim Iranian Oil. 9/11 would be an unintended consequence of controlling oil supplies. 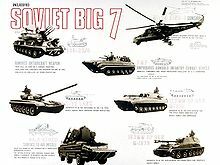 The 1955 USSR sponsored Warsaw Pact countered U.S. sponsored Western Europe NATO with an Eastern Europe eight communist nation mutual defense treaty. Congress passed the 1959 Landrum-Griffin Act regulated labor unions' internal affairs and their officials' relationships with employers. By decade's end the cold war would heats-up as Castro became a dictator with close ties to Communist Russia. 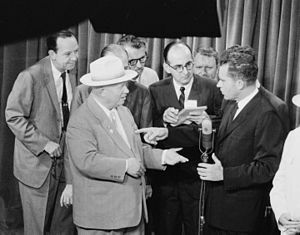 Vice President Richard Nixon and Russian Premier Nikita Khrushchev argued and debated in what became known as the Kitchen Debate. 1961 had the U.S. failed Bay of Pigs Invasion of Cuba authorized by President Eisenhower planned by the CIA with Richard Nixon as the outgoing administration's liaison. It would contribute to a fifty plus year and finally approved by new administrating. Kennedy brothers would never again trust the CIA. U.S. Trade Embargo on Cuba. President Kennedy set goals that President Johnson tried to fulfill with the government sponsored Great Society which blacks think is too little to late. OPEC formed in 1960 but years passed before these Oligarchs would show their mussel and raise oil prices creating gas shortages. Expensive oil energy would begin a multi- decade WW II created competitive advantage decline that had been enjoyed by American Oligopoly manufacturers and unions. Americans wanted small automobiles that limited pollution and this required a catalytic converter. Upstart Japan was much better at building these cars. Manufacturing and union oligarchs made decisions to maintain their own economic well-being as they delayed expensive employment and salary reductions. 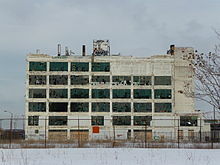 Companies did their best to maintain profits and American Rust Belt workers suffered as a result. A many decade- long slide in worker economic well-being began and it continues today. Education oligarchs push increased education as the answer but data and some leaders have taken a different view and feel education needs to be completely restructured. The Students for a Democratic Society (SDS) formed to wrestle control of power from white Oligarchs. The 24th Amendment prohibited both Congress and the states from limiting the right to vote in federal elections with the payment of poll taxes and other limiting devices. This was the beginning of the latest round of liberal attempts to share societies benefits among all citizens. 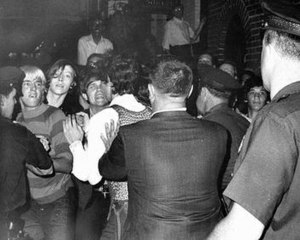 This included gays as the 1969 NYC Stonewall riots marked the beginning of a forty-five year U.S. gay rights movement. The decade ended with the White Lake NY Woodstock Festival, It was an enormously successful musical and cultural gathering which would become a milestone signifying how the young liberal baby-boom generation would move American ideals to the right. 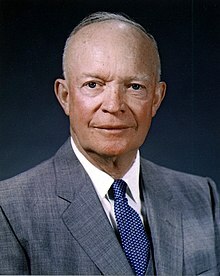 President Eisenhower's 1961 Military Industrial Complex speech warned of the dangers of a dominate military the collateral damage form the Vietnam War would lead to a revolt by draft age young people from the Baby Boomer Generation. President Kennedy was the first US President to use the CIA to spy on domestic reporters. What was known as Project Mockingbird was also used by Richard Nixon who was very active when it came to illegal activities. by the pre WW II economic recovery and the return of the troops. resulted in a large baby boom generation. The New York Daily News photo on Sunday, June 29, 1969, showing the "street kids" who were the first to fight with the police over Gay Rights. control oil supply and profits. A 1971 Nixon Shock ended the United States partial Gold Standard as Vietnam War deficits caused inflation and the dollar's loss in value caused foreign governments to withdraw gold. 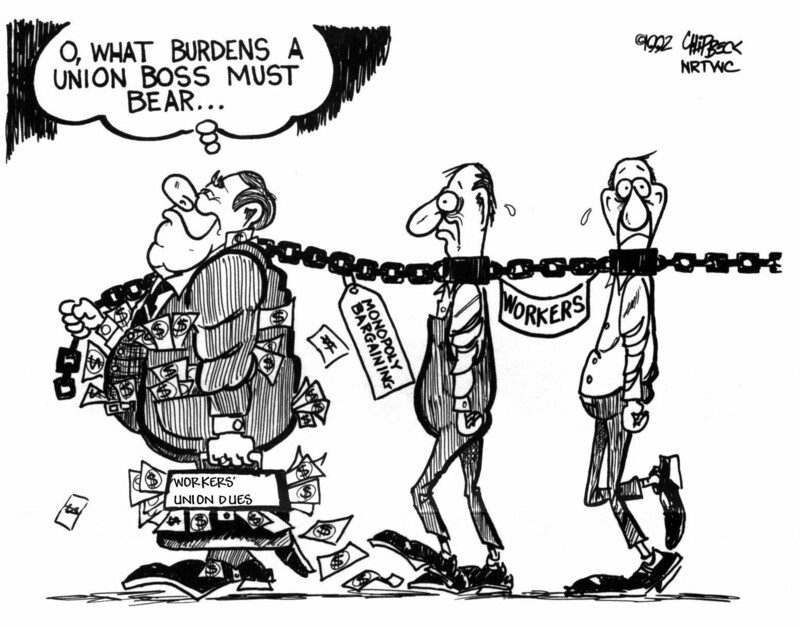 The 1970 Economic Stabilization Act froze many items including wages and salaries. It also put a 10% tax on imports to slow inflation. The 1972 Watergate Brake-In began the fall of President Nixon who was a weak president because of disagreements over the Vietnam War and the 1973–1974 Arab Oil Embargo which lowered supply and caused energy prices to skyrocket. Age of bank equation began when the Supreme Court ruled in Minneapolis vs. First of Omaha that states can't regulate interest rates of National Banks. 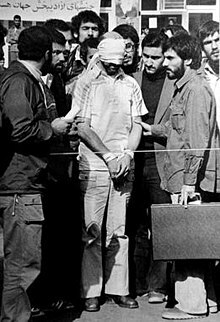 The U.S. embassy Iran hostage crisis late of the decades was a politically catastrophe for President. Carter. It was the beginning of collateral damage from Western efforts to control Middle East oil. Gasoline prices tripled to over $1 per gallon. The decade ends with Chrysler receiving government loan guarantees to avoid bankruptcy. Richard Nixon meets with Mao Zedong in Beijing, February 21, 1972. Binge buying a toping off a an almost full take resulted in long gas lines that ended with odd-even purchasing rules based on number plates. Click to enlarge most pictures. The 1981 troubled economy greets President Reagan took on was suffering from a new phenomenon known as <> stagflation. 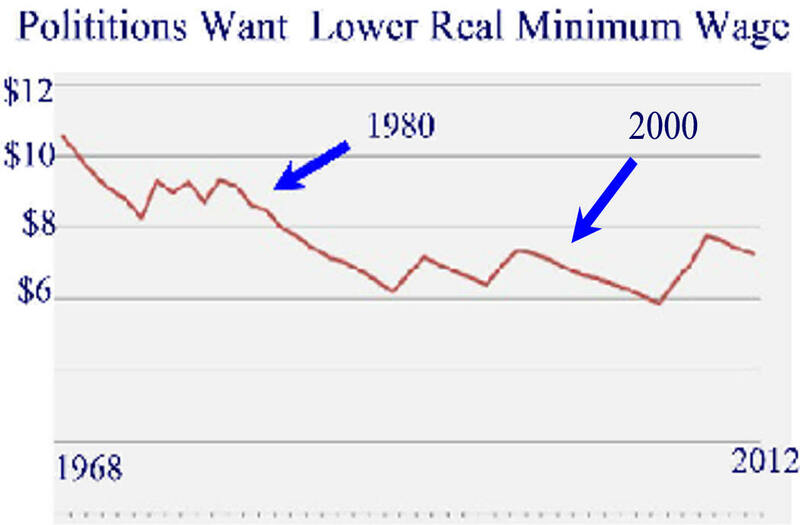 Increased unemployment and increased inflation had never simultaneous occurred in the U.S. It would be measured by the misery index. It went through the roof and President Reagan let FED Chairman Volker continue to tighten money to slow the economy and lower inflation. His efforts worked but caused two recessions. rescue Continental Illinois and begin the too big to fail banking policy of banking regulators. <> The new president's had pledged to use <> Supply-Side Economics <>as the solution to slow economic growth. First up was the Kemp-Roth Tax Cut. 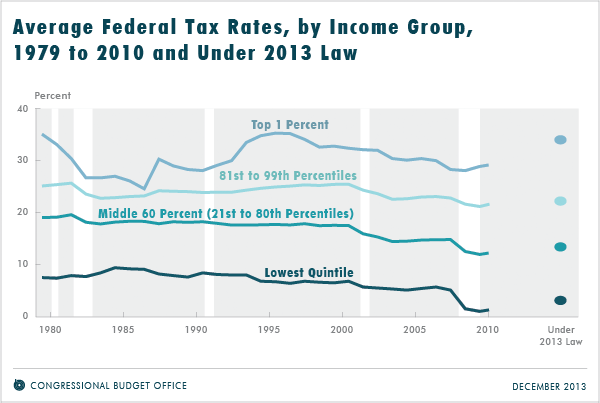 The lower taxes and less government red-tape campaign promises were fulfilled with the Tax Reform Act of 1986. It lowered taxes and significantly simplified the tax code but the campaign pledge of lower taxes went by the boards as first year federal tax revenues increased by $54.9 billion. The budget and trade twin deficits had everyone paranoid and Gramm Rudman Hollings Balanced Budget Act attempted to halt the recent massive increased federal deficit but it and measures to follow failed though to dates GDP has outgrown the federal deficit. The decade ended with the fall of the Berlin Wall and signifying the end of the Cold War. The 1992 election went to Clinton because of a slow economy and Bush1's broken 1988 pledge of Read My Lips: No New Taxes. Some felt actions of the FED affected this and other elections. Flat World. Clinton's 1996 reelection was helped by a strong economy and a Republican sponsored 1995-96 Government Shutdown. The 1999 Republican sponsored Gramm–Leach–Bliley Act repealed the depression caused Wall Street excesses outlawed by Glass Steagall Act Financial derivatives were exempted from regulation. Derivative excesses were given by many as a major cause the 2007 Great Recession. Signed by outgoing President Clinton it continued the deregulation started thirty years earlier by President Reagan. Editor's Note: Is it me or do Democratic Presidents sponsor free trade and then lose fights with republicans to raise the minimum wage. Also the Great Society started just before the peak. 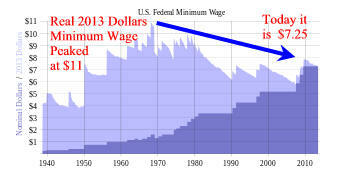 Now Obama Care must fight with an increase in the minimum wage which is at a 60 year low! Brooksley Born the 1996 to 1999 chairperson of the Commodity Futures Trading Commission which had oversight futures and commodity options markets lobbied Congress and the President to give the CFTC oversight of derivatives. CFTC regulation was strenuously opposed by FED chairman Alan Greenspan, and by T. Secretaries Robert Rubin and Lawrence Summers. Tax Cuts of 2001 and 2003 when combined with fighting Wars on Terror around the world but especially in Iraq and Afghanistan fueled large debt increases. Proving he is not an exact copy of RR, Bush 2 signed the Medicare Act of 2003 which increased benefits and cash outflow by $400 billion over 10 years again proving voters can b bought. The Global Financial Crisis of September 2008 began as the stock market crashes. In response, U.S. President George W. Bush signed the revised Emergency Economic Stabilization Act which created a 700 billion dollar Treasury fund to purchase failing bank assets. The decade ended with a series of Tea Party Protests conducted across the United States focused on smaller government, increased fiscal responsibility, increased individual freedoms and what conservative have historical viewed as part of the Constitution. President Barack Obama obtained Congressional approval for a $787 billion stimulus package which was the largest since President Dwight D. Eisenhower. Unlike Europe where the Southern Poor Want Help from the Wealthy North, Rural America Votes Against Government Interference With Their Lives Concerning Healthcare, Education, Gun Violence ...Click to enlarge. My limited knowledge of history begins when Jesus and disciples formed a liberal Oligarchies to direct Western Civilization in their interpretation of the appropriate direction. Some Jews joined but most avoided change and stayed with their conservative Oligarchs. Eventually Christianity became mature and morphed into a conservative oligarchs. The Protestant Reformation started as a liberal group of oligarchs but then morphed into conservatism. All groups have done much good and in their attempt to guide society in their chosen direction. But this liberal to conservative oligarchies dialectic extends beyond religion to politics and most of human life. It is called human natures. As all human characteristics follow a normal distribution and when the extremes of any human characteristic are in control, outliners occur and a “Black Swan” rules the roost until removed from power by another swan.